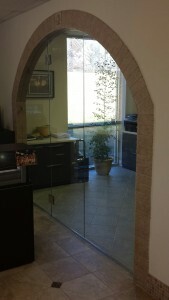 Do you need custom glasswork for your Raleigh home or business? Proglass Custom Showers and Mirrors offers our customers nearly endless custom glass options to fit your every need. Whether you need very specific dimensions, cut to order, or are simply looking for a standard size piece of glass, Proglass can help you fill your needs. We also offer a number of decorative glass options, perfect for china cabinets, display cabinets or shower doors. Not only can you select your glass dimensions, but you may also go as far as choosing a color tint for your piece. When you work with Proglass, your glass is truly customizable. Learn more about our glass cut to order here. Accidents happen, and we understand that. If you have just one or two broken window panes, there’s no need to replace the entire window. Proglass is happy to help you replace or repair broken window glass and we are at your service fast! Learn more about our window replacement & repair services here. Don’t wait any longer to get that custom piece of glass you’ve been putting off. When you work with Proglass we make it as easy on you as possible. Call us or fill out our contact form today to get started! We serve customers throughout Raleigh, Cary, Apex, Wake Forest and surrounding NC areas and we would love to work with you!